It’s September the first already, I cant believe how fast this year has gone by. The days are starting to draw in now which is just miserable and most of the veg I planted back in Spring has been harvested. 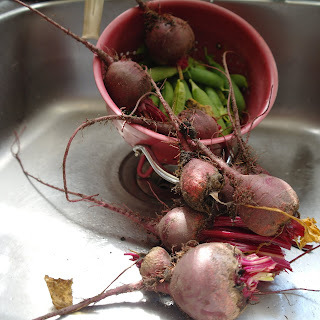 My big success was the beetroot, we have three jars of it pickled. The peas turned out well too, though next year I will grow normal size varieties instead of the dwarf, patio, type. Hopefully I will then get more than I did this year ( two meals worth!) The carrots are a bit of a disappointment, it looks like something has got to them as they are a bit raggy in places and my red onions aren't much bigger than the sets I planted. Still my mum says they taste nice :) So the plan is that next year I will grow onions, peas and beetroot outside and tomatoes, aubergine and courgettes inside the greenhouse. I'm going to do a little research to see what I can grow over Winter.Here is a pic of some of the beetroot and peas waiting to be washed and boiled. I think I did ok for a first time! I am going to try and blog more this month, I'm aiming for everyday tho that may mean some of the posts are very boring and of the 'got up, didn't do much, went to bed' variety.... perhaps I will have to make September more exciting so I have something to write about! Maybe a lottery win! Sounds like you had a very successful 1st year of growing, and there's plenty that you can grow over winter to keep you busy. I know what you mean about the days getting shorter, you wonder where summer went, don't you! It sounds like you've got lots of exciting things planned for the autumn and winter, though. Let us know how it all goes, whatever you do. Hi Harriet, thanks for joining my blog, I've joined yours, it looks great! Congratulations on the veg! I was looking at your profile and it seems we have something in common besides Folksy, I have CF running in my family and we have had quite a lot to do with the CF trust these past years. Keep up the blogging!